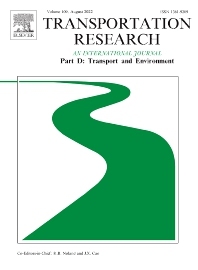 Transportation Research Part D: Transport and Environment publishes original research and review articles on the environmental impacts of transportation, policy responses to those impacts, and their implications for the design, planning, and management of transportation systems. It covers all aspects of the interaction between transportation and the environment, from localized to global impacts. All impacts are considered, including impacts on travel behavior, air quality, ecosystems, global climate, public health, land use, economic development, and quality of life. The journal invites submissions of research papers on all modes of transportation. This includes maritime and air transportation as well as all modes of ground transportation. Papers dealing with sustainability and resilience of the transportation system and its infrastructure as well as the impacts of a changing climate on cities, regions, and networks are welcomed. The emphasis of the journal is on empirical findings and policy responses of a regulatory, planning, technical or fiscal nature. Articles are primarily policy-driven and should be relevant and applied as well as being accessible to readers from a wide range of disciplines. There are no disciplinary boundaries to work considered and submissions of an interdisciplinary nature are welcomed. Equally, the journal is fully international in its orientation and invites contributions from economically developing, as well as more economically advanced, countries. Submissions should not be primarily modeling exercises but have a clear policy-driven scope that delves into impacts and solutions to improve environmental outcomes. We are pleased to announce the formation of a new section of Transportation Research D focusing on Disasters and Resilience. This section will be edited by Karl Kim (University of Hawaii), John Renne (Florida Atlantic University) and Brian Wolshon (Louisiana State University). Transportation plays a critical role in the resilience of communities. Disasters are unexpected, low probability events which can overwhelm the capacity of systems to function and provide vital services supporting human health, environmental quality, and economic and social livelihoods. Transportation systems are essential to effective disaster response, relief, recovery, and mitigation. Emergency responders must be able to travel quickly to disaster scenes. Households, firms, and transport agencies need to develop and implement evacuation and sheltering plans involving the management of different modes, vehicles, roadways, and systems to ensure safety and security. Transportation systems need to be integrated into risk and vulnerability assessments, recovery and reconstruction projects, and longer term efforts to plan, design, and engineer resilient facilities and communities. Transportation systems serve as the connective tissue which links both internal and external resources associated with disaster response and recovery. This section of Transportation Research D will build on the special capabilities and interests of transportation researchers, coming from multiple disciplines, worldwide, to address the critical ways in which transportation science and the supporting theories, methods, and tools can be applied to increase societal resilience against all hazards, both natural and man-made. In addition to the wide range of natural hazards including both geo-physical and hydro-meteorological, the section will also cover industrial accidents, cascading events (where one hazard such as an earthquake can trigger a release of toxins and harmful substances into the environment), and intentional acts of sabotage or terrorism. In each of these disasters and emergencies, transportation plays a significant role. Core concepts such as travel demand modeling, rare event forecasting, activity based analyses, system performance monitoring, optimization across time and space, mode choice, network analysis, geospatial modeling, and many other methods are appropriate topics for this section. Part D's aims and scope are complementary to other journals in the Transportation Research series. This includes Transportation Research Part A: Policy and Practice, Part B: Methodological and Part C: Emerging Technologies, Part E: Logistics and Transportation Review, and Part F: Traffic Psychology and Behaviour. The complete set forms the most cohesive and comprehensive reference of current research in transportation science. Submissions more appropriate for other journals in the series will not be accepted.